The temptation to attack was irresistible. 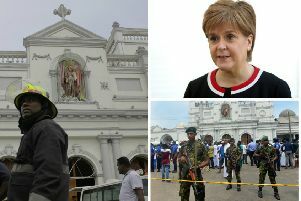 As First Minister Nicola Sturgeon travelled around the US last week, stopping off at Stanford University in California to deliver a speech on the rarely discussed subject of independence before travelling to New York for a back-slapping get-together with defeated presidential candidate Hillary Clinton, her opponents at home could not help but snipe. Scottish Liberal Democrat leader Willie Rennie criticised her for making California another stop on her “global grievance tour”, while Labour MSP Jackie Baillie accused her of ignoring failings in the economy in order to go “swanning around” talking up the prospects of a second independence referendum. These attacks were entirely predictable. What’s more, the case could be made that they were also entirely justified. After all, with the Scottish economy another dreadful quarter away from recession, surely the First Minister should have been in Edinburgh, devising solutions to problems on her doorstep rather than playing the international stateswoman? But just because that case can be made, it doesn’t mean it should. We could also argue that, with the Scottish economy in a grim state, Sturgeon should be getting out there, selling Scotland as a modern, accommodating country, open for business and ready to assist any investors who might happen to have the power to create jobs or place orders with Scottish companies? As it does with every aspect of our national debate, the ongoing battle over the constitution has bled into the matter of the FM’s trip and shaped the responses of her opponents. In the current climate, it is not only essential to opposition politicians that the First Minister fails when it comes to Scottish independence: she must fail in every regard. This is not, I’m bound to say, in Scotland’s interests. A first minister is not – or certainly should not be – simply an administrator. He or she should be a confident salesperson for Scotland. We don’t need a tweedy introvert tethered to a desk in Edinburgh, we need someone who will go out there on behalf of the nation and talk us up a bit. Sturgeon’s opponents cannot have it both ways. Either they think she should be doing what it takes to generate interest in Scotland (and this may involve a degree of international travel) or they don’t. The stakes are high in the constitutional battle. On policy, all major parties might congregate somewhere around the centre, but on the matter of independence there is real and acrimonious division. And, because every aspect of our government is viewed through a constitutional lens, the same division is transplanted on to other issues. In truth, Labour and the SNP (and, for that matter, the Lib Dems and Tories) agree – or could, if the will existed, find agreement – on a number of issues from the NHS to the education system. But, because any perceived success on the part of the Scottish Government might risk the SNP gaining ground on the independence question, entirely phoney wars have blown up around matters where co-operation could – and should – have taken place. There is no easy solution to this inevitable state of affairs. Even before the last independence referendum, the SNP was making decisions with an eye to the constitutional question. Former justice secretary Kenny MacAskill has admitted that ministers took the decision to deny the vote to prisoners not because he and his colleagues believed it was the right thing to do but because they feared a voter backlash that might harm the Yes campaign. If the SNP makes the effect on the independence campaign a priority when it comes to policy decisions then opposition parties can hardly be blamed for attempting to undermine the nationalists’ constitutional case by attacking their domestic record. It is surely in the interests of Scotland for the First Minister’s trip to the States to be a success? Of course, Sturgeon is going to make the case for independence – she makes no secret of her preference for a Scotland outside of the UK – but opponents must guard against willing her to fail at all times because they disagree with her on the issue. There’s a lot of noble talk, right now, about how the second independence referendum campaign must take place in an atmosphere of mutual respect, but back in the real world, we are in for a bruising battle. There is so much to lose for both sides that, when the going gets tough, campaigners will have no compunction about fighting dirty. Whatever it takes to win will be considered acceptable. Scotland stands to suffer considerable collateral damage from the divisive campaign to come. Already, public services are struggling and the economy is in a parlous state. There is a case to be made, for sure, that the First Minister should consider the current climate and postpone her plans for another vote on the future of the United Kingdom. Since, however, we can be absolutely sure that Sturgeon has no intention of giving up on her independence ambitions (and why should she?) we can only hope that both sides of the campaign think about the wider implications of their lines of attack. The best that can be said about indyref2 is that one day it will be over and Scotland – whatever the decision of this particular generation of voters – can get back to talking about the services upon which we depend. Until then, keep your heads down. Scattergun attacks from both nationalist and unionist camps are going to make a bloody mess.